The blend of pumpkin and gingerbread flavors not only gives a wonderful aroma to your kitchen, but will also make a memorable dessert for your family and friends this holiday season. Preheat oven to 350°F (175°C). Lightly grease 9-inch springform pan. 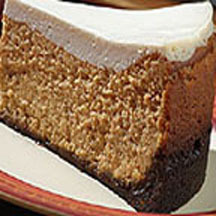 For Cheesecake: Beat cream cheese, granulated sugar and brown sugar in large mixer bowl until creamy. Beat in pumpkin, Coffee-mate and eggs. Add cornstarch and cloves; beat well. Pour into crust. For Topping: Combine sour cream, granulated sugar and vanilla extract in small bowl; mix well. Spread sour cream mixture over surface of warm cheesecake. Bake for an additional 5 minutes. Run knife around edge of cheesecake. Cool completely. Refrigerate for several hours or overnight. Remove side of pan. *Try substituting Cinnamon Vanilla Crème NESTLÉ COFFEE-MATE Liquid Coffee Creamer.